More than 22,000 girls have signed up for this month's FA Girls’ Football Week, as the new initiative aimed at driving female participation continues to exceed targets. With three weeks still to go until the first of two official event weeks planned for 2016, over 22,300 girls aged 5-16 have already signed up to take part, almost 5,000 above the original target. This year the event has been expanded to two weeks, following the success of the FA's inaugural Girls' Football Week in October 2015 which, with the England national team's World Cup exploits still fresh in the memory, saw more than 16,000 girls take part - more than triple the target. The first week, which kicks off on Monday 25 April, is aimed at primary and secondary schools, encouraging them - along with clubs and community groups - to run female football sessions. More than 200 schools have signed up to take part in the week. The second week, which will focus on raising participation at higher and further education establishments, will take place from 10-16 October. FA national participation manager Donna McIvor said: “It’s great news that we have exceeded our target already and the week looks set to be a fantastic showcase for girls’ and women’s football participation. “This is testament to the work that we and our partners have put in to raising awareness of the weeks, its aims and to the staff working at schools, clubs and community groups across the country who will help make the week a big success. 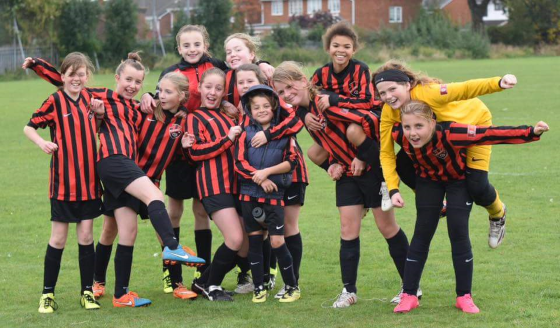 Football is the most popular female team sport in England, with more than 5,900 women’s and girls’ teams playing affiliated club football, involving over 2.89 million players. The Girls' Football Weeks are being delivered in partnership with Independent Schools FA, English Schools FA, Association of Colleges Sport, British Universities and Colleges Sport, the Premier League and the Football League. To find out more about Girls' Football Week, or similar FA initiatives, visit thefa.com/womens.